Colorado Gov. 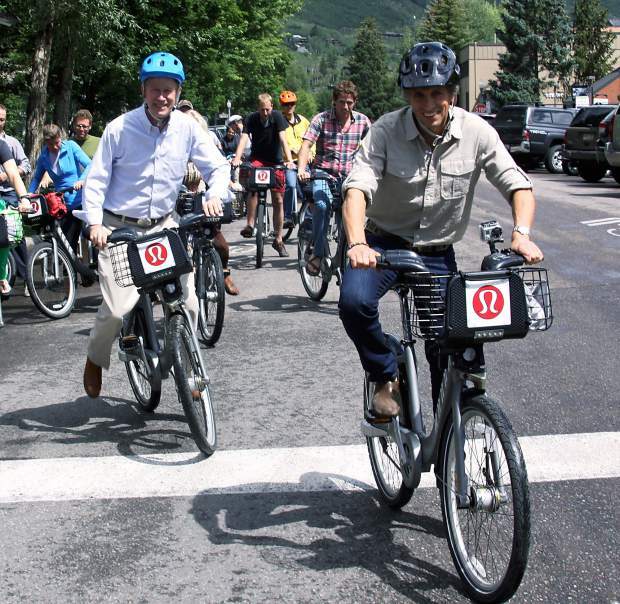 John Hickenlooper, left, and Aspen Mayor Steve Skadron enjoy a ride on We-cycle bikes in Aspen in August 2014. Both were supporting Colorado Day 2014 while promoting bike sharing in Colorado. The We-cycle program had its last day of service for 2014 on Saturday, wrapping up another year of growth and innovation with the bike-sharing program. The We-cycle program features a fully automated bike system that includes 100 bikes and 14 stations throughout the Aspen area available 24 hours a day. We-cycle offers an array of different passes, and all include unlimited 30-minute rides. The program has never been advertised as a bike-rental business; instead, the program is highlighted as a complement to Aspen’s transportation options. In 2014, the program had more than 17,600 rides, a 76 percent increase in use from 2013. There were 465 season-pass holders this year, and the number of kiosks increased from 13 to 14. Matt Reed, 31, has lived in Aspen for four years and works for the Aspen Center for Environmental Studies as a naturalist guide. He began participating in the program this summer. In 2014, We-cycle also developed a simplified, day-pass rider experience that streamlines access to the bikes. At the Aspen Ideas Festival this year, all the participants were given the new day passes, which allowed the visitors to use the program like locals do. For 2015, Mallory said she expects to be back up and running by mid-May, as long as the weather cooperates. She’s hoping We-cycle adds a few more stations throughout the Aspen area and broadens the service area, as she’s heard requests for kiosks in Burlingame, near Eighth Street, by the Red Brick Center for the Arts, the Aspen Business Center and at the Aspen Recreation Center. She’s also hoping to encourage more businesses to provide passes to employees so the bike sharing can be used as a complement to the local bus system.